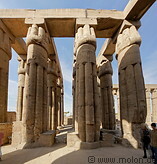 The Luxor temple lies at the southern end of the Thebes temple complex on the east bank of the Nile river. It extends from northeast to southwest over an area of 260m x 80m and is connected to the Karkak temples through a 2 km long sphinx avenue. The temple was built during the reign of the New Kingdom pharaoh Amenhotep III (1390-1352 BC) and expanded under Ramses II. The temple is dedicated to the worship of the Egyptian god Amun, his wife Mut and the moon god Khons. The temple ruins are impressive, starting with the mighty pylon at the northeastern end through a series of halls and columnades.